The Adare Manor Carriage House Restaurant showcases the best in artisanal and local produce, prime Irish dry-aged beef, and fresh fish. The 5-Star Adare Manor is delighted to announce the opening of the Adare Manor Carriage House Restaurant, Terrace and Bar – a wonderful addition to the resort, where guests can enjoy an exquisite artisan grill experience in a stylishly relaxed atmosphere, a glamorous cocktail bar and lounge, spacious glazed terrace, cigar lounge and private dining chamber. 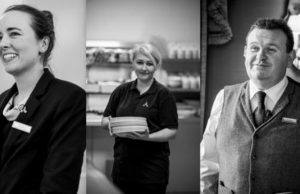 The team of dedicated chefs, led by Director of Culinary, Loughlin Druhan, have created an exciting menu featuring ingredients sourced from Ireland’s best producers around the country. The menu at The Carriage House Restaurant and Terrace has something for everyone and includes Connemara lamb, Atlantic lobster and some of the best prime cuts of beef, grilled to order. The Adare Manor Carriage House, which is set on the estate of Adare Manor opens following an extensive restoration and refurbishment programme. Every detail of the interior design has been chosen to celebrate the natural beauty and wonder of Adare Manor’s estate and is located just a three-minute walk from the Manor house. The Carriage House lobby sets the tone as the grand entrance, with a working replica of the 1886 Benz Patent-Motorwagen centrepiece, which is already attracting great interest. Speaking today on The Carriage House opening, Paul Heery, General Manager of Adare Manor said, “There has been much anticipation of the opening of The Carriage House Restaurant, Terrace, and Bar. Our great team at Adare Manor have enjoyed putting the finishing touches on this wonderful addition to the resort. 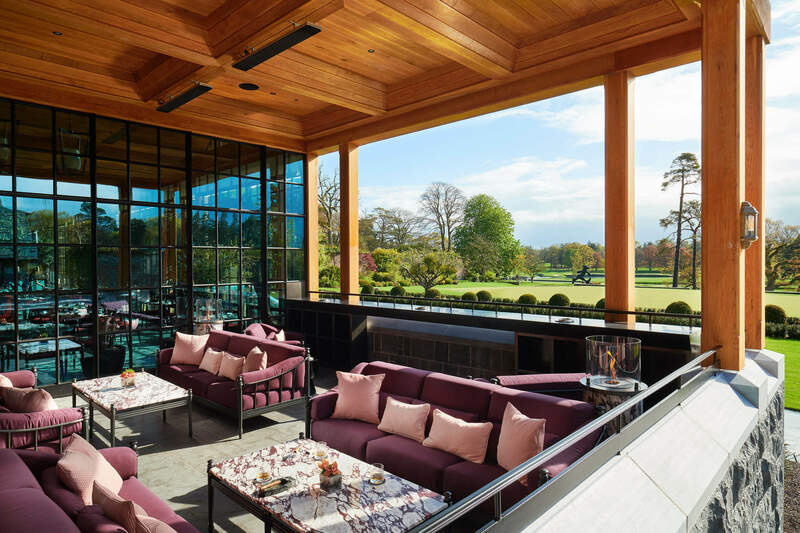 Every detail has been chosen to compliment and celebrate the great natural beauty and views of the surrounding landscape of the Adare Manor estate and newly reopened golf course. We want all our guests to enjoy a comfortable, relaxing, yet luxurious dining experience, with the very best of Irish produce. 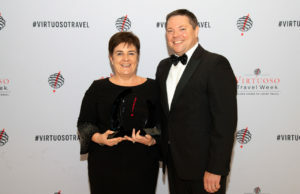 “Since we re-opened Adare Manor late last year, we have received huge local support, and we have welcomed guests from Adare, throughout Ireland and internationally. With the opening of The Carriage House, we look forward to now offering a new guest experience”. 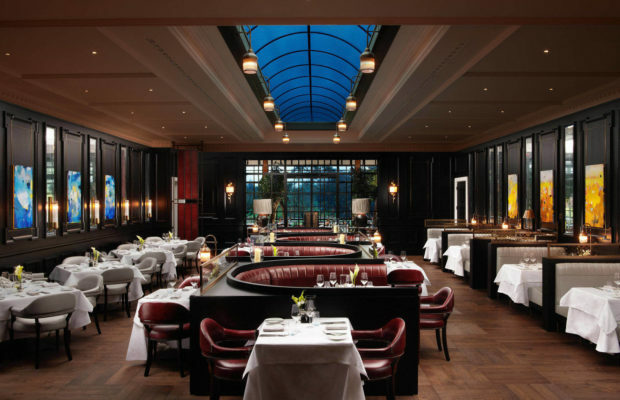 The Adare Manor Carriage House Restaurant showcases the best in artisanal and local produce, prime Irish dry-aged beef, and fresh fish. Open for dinner daily, the menu shines a spotlight on Irish favourites with an elegant flare, including Connemara lamb and Atlantic lobster, alongside some of the best prime cuts of beef, grilled using sustainably sourced charcoal. The architectural highlight of the restaurant is its beautiful central skylight and delicate seeded glass panels that allow natural light to flood the room, offering an artfully lit ambiance from day to night. For private dining, The Carriage House offers an elegant private Chamber to accommodate parties of up to 28 persons, which can also double as an exclusive meeting room. The Bar is the social heart of the hotel, offering light bites alongside a remarkable collection of fine wines, craft beers, and sophisticated cocktails. Designed as a perfect union of traditional Irish culture and elevated contemporary styling, the rich leathers, dark-stained oak furnishings and an impressive Breccia Capraia marble framed fireplace, offer a sense of timeless luxury. The glazed Terrace is a culinary destination serving lunch and breakfast daily. The glazed Terrace is a culinary destination serving lunch and breakfast daily. Boasting striking views of the putting green of the newly reopened golf course and manicured landscape, the Terrace perfects the transition between indoors and out. Taking centre stage is the open show-kitchen, allowing guests to observe as chefs artfully prepare refined salads, sandwiches, and gourmet pizzas. Adjoining the Terrace through a glazed wall is the intimate Cigar Lounge, perfect for those yearning to pair their smoke with a rare Irish whiskey from the hotel’s exceptional collection. The Adare Manor Carriage House Lounge is a haven of peace and relaxation, an ideal area for reading or quiet conversations. In the evening, the lounge becomes a welcoming extension to the bar, where guests can relax over a drink or enjoy the company of friends. The Golf Course at Adare Manor was re-opened last month by four world-renowned Irish golfing stars, Rory McIlroy, Padraig Harrington, Paul McGinley and Shane Lowry. The course was completed redesigned, remodeled and rebuilt by a team lead by world-renowned golf course architect Tom Fazio. Over a two-year reconstruction period, the Fazio Design and Adare Manor team established a 7,509-yard championship golf course created to the most exacting of standards with the goal of establishing the course amongst the finest in the world. The Carriage House also offers a comprehensively stocked Pro Shop. 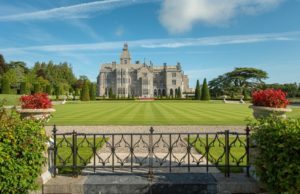 Adare Manor plays a key role in the local community and it is estimated that the resort will contribute more than €15 million to the local economy annually. Set on an 840-acre estate, Adare Manor in Co. Limerick is one of Ireland’s leading five-star castle properties. The resort re-opened in November 2017 following an extensive restoration, refurbishment, and expansion programme over a 21-month period. The expansion included a new 42-bedroom wing, increasing accommodations to a total of 104 guest rooms, and a ballroom which can host up to 350 guests. Situated in the heart of picturesque Adare Village in Co. Limerick, Adare Manor is surrounded by medieval ruins, walled gardens and winding woodland paths and just 25 minutes from Shannon International Airport. For more stories on the Adare Manor go here. For more info on the Adare Manor go here.